Lately I’ve been making plans to purchase a little camper trailer, fix it up, and take off on road trips throughout North America, up to Yellowstone National Park, across Canada, and dropping down to the east coast of the USA. And I’d love to tour the Southwest, there is so much to see right here in the USA! I’ve had a few really great road trips in the past. Years ago, Matt and I drove upstate New York through Connecticut, Rhode Island, Cape Cod, and all the way to Boston on a fall foliage tour. Another time we drove in a loop through Arizona, from Tucson to Scottsdale to Prescott and Sedona. And there’s always the quintessential coastal California road trip from San Diego to San Francisco, I’ve done that a few times and it’s the ultimate scenic road trip. There’s a life to be lived towing a trailer or driving a RV and parking it on campsites across the country, and I’m learning there are so many communities and forums with people who share their RV/trailer experiences. I can’t wait to dive into that lifestyle someday soon! I have a secret obsession with trailer renovations, it seems like such a fun challenge and an opportunity to get creative with teensy tiny spaces, right? And Vonnie the Van (camper). Tour a beautifully done 1980s camper renovation by All Things With Purpose, I love the black and white palette! Here’s another fantastic DIY renovation by The DIY Mommy! The wallpaper in this Airstream renovation by Bonnie Christine is so fantastic, as are the decorative touches. Ashley and Mike of Joyfully Growing have some tips about renovating RVs with style! 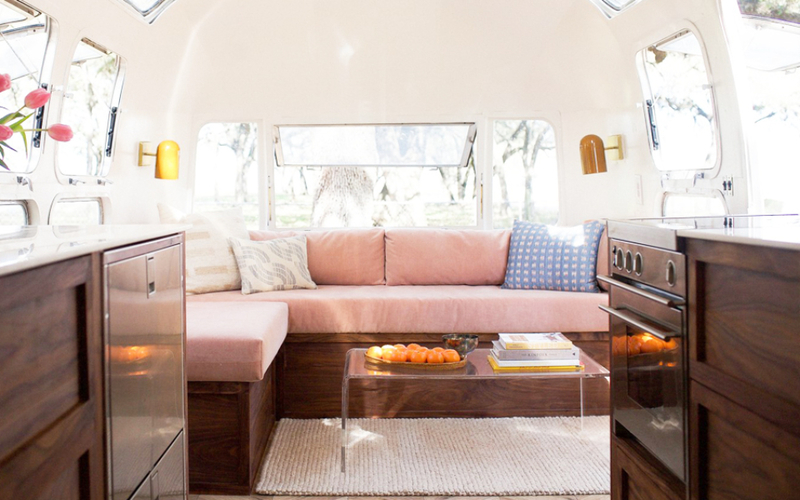 A lot of these trailer renovations are happening now on Instagram, here are a few notables to watch if trailer life and renovation is your thang! Any other trailer/RV/camper renovations you’re following? Let me know I’d love to follow along too! Some might call this color greige, some may call it mushroom, some may even think it’s khaki but I have always called it taupe, a color that’s the perfect balance between tan and gray, and a desirable neutral. On cabinets it looks amazing paired with matte brass hardware. The colors in natural light that are closest match to my Oat cabinets are 1) Sherwin Williams ‘Shitake’, 2) Benjamin Moore Affinity ‘Pashmina’, 3) Benjamin Moore ‘Stone Hearth’, and 4) HG Sherwin Williams ‘Loggia’. Finding a great taupe is a tricky but not impossible. You don’t want green or yellow or lavender undertones. I narrowed down a great collection of taupe colors for you to choose from! In addition to cabinets, taupe is a really great color for a home’s exterior! I’m considering doing this paint swatch color matching as a series, is there any color you’re looking for that I can help with? A perfect slate blue perhaps?